Calculate the dominating color from our image sample. In my previous article I showed how to use box2d-web and deviceorientation to rol around a set of circles using standard HTML5 APIs. My initial goal of that article was to load in an image, translate it to a series of seperate circles, and let you play around with that. But that’s for later. For now I’ll show you how you can use canvas together with web workers to offload heavy computing functions to a background thread. For those wondering, that’s my daugther thinking very hard about something. You can see this demo in action here. Wait until the image is loaded. Split the image into seperate parts ready for processing. Let’s begin simple, and look at the image loading code. // start processing when the document is loaded. // wait for the image to be loaded, before we start processing it. As you can see here, we register the jquery ready function first. This will trigger when the complete document is loaded. This however doesn’t have to mean that the images have also already been loaded. To make sure the image is ready to be processed, we add the jquery load function to our source image (has id of #source). When the image is loaded we determine the required size of our target canvas, on which we render the result, and fire of the rendering using the renderElements function. The renderElements function splits the image and fires of the webworkers. 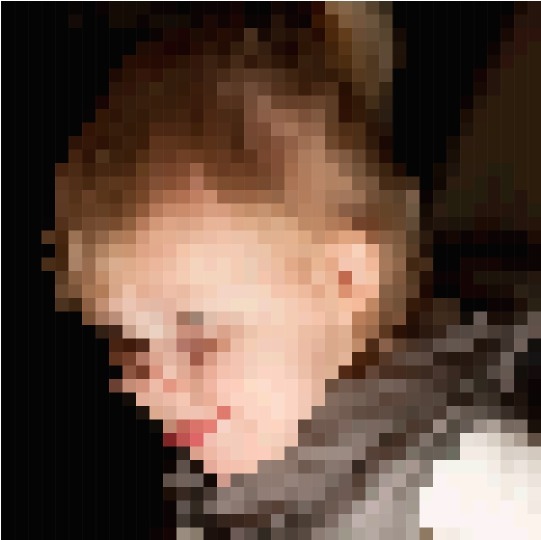 The goal of this example is to create a kind of low pixel effect on our source image. We do this by selecting part of the image, calculate the dominating color, and render a square on the target canvas. The following code shows how you can use a temporary canvas to select part of the image. // send to our worker. This is a convience class that serves as the message to and from our webworker. Note that we need to convert the result from the getImageData call to a normal array. Information to a webworker is copied, and chrome at least isn’t able to copy the resulting array from the getImageData operation. So far so good. We now have nice workpackages for each part of our screen, which we pass to a webworker using the worker.postMessage operation. But what does this worker look like, and how do we configure it? We create the worker in the setupWorker operation that is called when our document is loaded. This worker uses two external scripts to calculate and return the dominating color. It does this by getting the required information from the workpackage, calculate the dominating color, and return the result in the workpackage using the postMessage. Calculating the dominating color itself isn’t that easy. I ran across a great library named color-thief, that does this for you. Apparently you need to take more into account than just the RGB values, if you do that then you just get a set of brown colors. This, however, isn’t directly provided by color-thief. Color-thief assumes you want to use it directly on an image element on your page. I had to extend the color-thief library with the following simple operation so that it can work directly with binary data. This returns an array of most dominating colors (just as the normal color-thief functions do) but can work directly on the data from our worker. 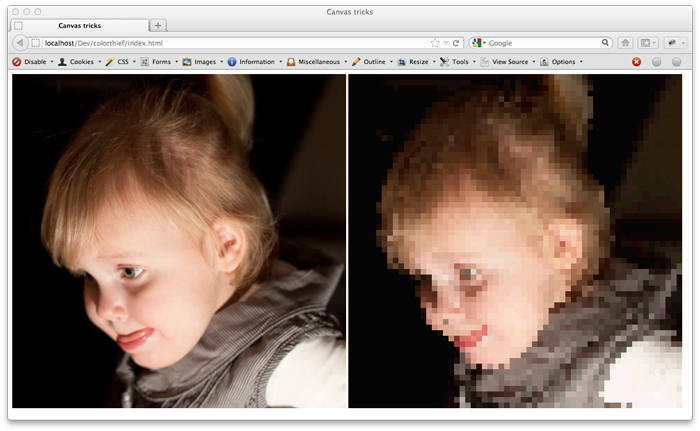 As you can see web workers are really easy to use, and canvas allows us much options to work with imagedata. In this example I only used a single web worker, more interesting would be to add a queue on which multiple workers would listen to really process elements in parallel. The demo and complete code for this article can be found here.